Pompe disease is a metabolic myopathy which leads to severe and progressive weakness due to glycogen storage in striated muscle and neurons. Generalized weakness leads to cardiopulmonary insufficiency and early mortality. The spectrum of disease ranges from a fatal early-onset form to a more slowly progressive intermediate and adult-onset type. The severity of disease depends on the amount of residual acid α-glucosidase (GAA) activity which is determined by the nature of the two mutant alleles. The lack of GAA leads to accumulation of glycogen in lysosomes of neurons and striated muscle (especially skeletal and cardiac muscle). Lysosomal dysfunction and cellular autophagy result in neuronal cell loss over time. Enzyme replacement therapy (ERT) is the only currently approved treatment for Pompe disease; however, ERT does not effectively address the neural deficits; therefore, alternative approaches using gene therapy must be considered. 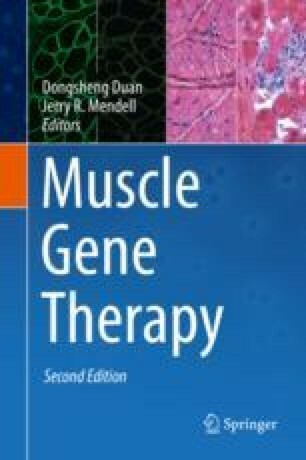 The principal objective of gene therapy in Pompe disease is to increase the intrinsic ability of the cells to produce GAA. A variety of recombinant adeno-associated viral vectors (rAAV) are being studied to complete this task. The efficacy of gene therapy not only depends on the efficiency of the gene therapy agent but also on the host's immune response. The most critical immunological challenges are anti-AAV capsid antibodies and anti-GAA antibodies. In this chapter, we review the current status of AAV-mediated gene therapy for Pompe disease.